Basilica San Marco, the grand, multi-domed church on Saint Mark's Square is one of one of Venice's top attractions and one of Italy's most spectacular cathedrals. Exhibiting influences from Byzantine, Western European, and Islamic architecture all related to Venice's past as a major seafaring power, Saint Mark's Basilica is truly an embodiment of the Venetian aesthetic. 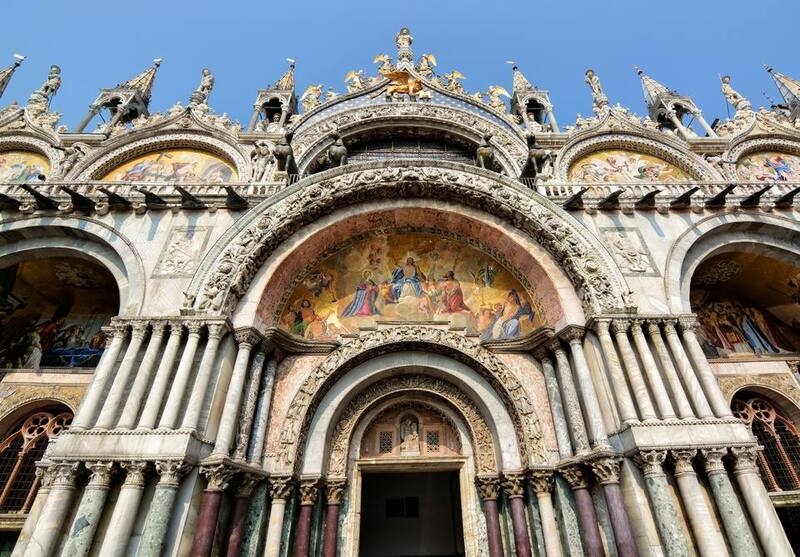 Visitors flock to Basilica San Marco to admire its gleaming, golden Byzantine mosaics, which adorn the church's main portal as well as the inside of each of the basilica's five domes. Most of the astounding ornamentation of Saint Mark's Basilica dates from the 11th to the 13th centuries. In addition to gorgeous mosaics, Basilica San Marco also houses the relics of its namesake, the apostle Saint Mark, and the sumptuous Pala d'Oro, a golden altarpiece decorated with priceless jewels. A visit to Saint Mark's Basilica is a must for a first-time tourist to Venice, and indeed the church holds so many precious artworks and relics that subsequent visits are recommended. If your schedule and budget allow, we strongly recommend a private or small group tour of the Basilica, both in order to skip the line, spend more time inside and better appreciate what you are seeing. Recommended companies include The Roman Guy, Select Italy, and Walks of Italy. Location: Basilica San Marco dominates one side of Piazza San Marco, or Saint Mark's Square, the main square of Venice. The square and basilica combined form one of the most iconic and recognizable scenes in the Western world – be sure to take a moment and soak in the beauty before you head to the entrance doors. Hours: Saint Mark's Basilica is open Mondays through Saturdays 9:30 AM until 5:00 PM and Sundays until 4:30 PM (5 PM in the summer). Last entrance is usually 15 minutes before closing. On religious holidays, especially at Easter and Christmas, the basilica may open late or close early, so be sure to check current times before you try to visit. Admission: Admission to the Basilica is free, but visitors should expect to pay entrance fees during holidays or to special parts of the basilica complex, such as the Saint Mark's museum, Pala d'Oro, the Bell Tower, and the Treasury. To help manage the dense crowds, visitors are allowed approximately 10 10 minutes to walk through and admire the basilica's beauty. Crowds: Venice is a famously crowded city, and those crowds all seem to descend on Saint Mark's Piazza. Lines to enter the Basilica and the nearby Doge's Palace can be long at almost any time of year, but peak in the summer months. If you haven't arranged for a private tour or skip the line tickets (see below), summon your patience and be prepared for a wait of up to a few hours. On hot, sunny days, wear a hat and comfortable shoes, and bring a bottle of water. To maximize your visit and ensure that you spend more time inside Saint Mark's than queued up outside of it, consider reserving a ticket (free, with a service charge). You can book your free reservation (for a 3 euro service fee) on the Veneto Inside website for a specific day and time from April 1 through November 2. You can also take a guided tour of Saint Mark's Basilica. Guided tours are available at 11 AM, Mondays through Saturdays from April to October. See the Basilica San Marco website for further details and information. Visitors may attend mass for free and it requires no reservations at this time. However, visitors are also not allowed to tour the church during mass. Note that on special holidays, such as Easter, the mass will be very crowded so arrive early if you really want to attend. Important Restrictions: Visitors will not be allowed inside unless they are dressed appropriately for entering a place of worship (for example, no shorts). Photographing, shooting video or bringing luggage into the Basilica is also prohibited. Find out about what to see in Saint Mark's Basilica so you can make the most of your time inside the cathedral. What Are the 7 Best Islands to Visit While in Venice?